Mast cell tumors (MCTs) arise from malignantly transformed mast cells. 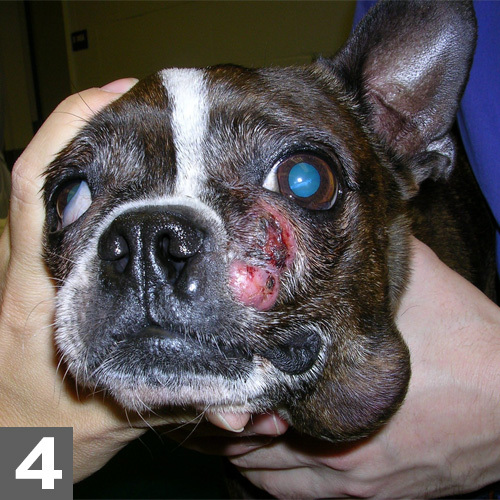 In dogs, most of these tumors arise as primary tumors in the skin. 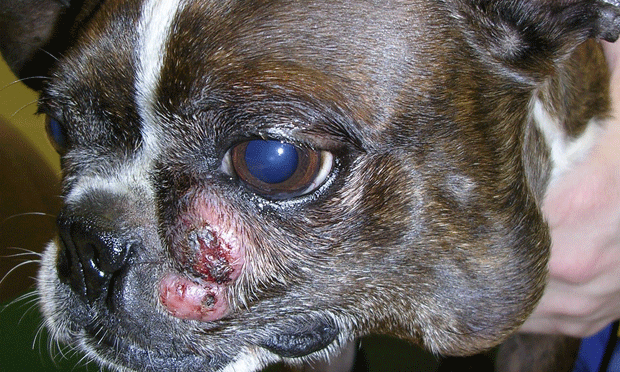 They are the most common skin tumor in dogs, accounting for roughly 20% of all reported skin tumors. Any breed may be affected but certain breeds are predisposed, including golden retrievers, Labrador retrievers, Boston terriers, boxers, and pugs. Pugs are more likely to have multiple MCTs at diagnosis (56% of dogs in 1 study), but these tumors demonstrate more benign behavior and rarely lead to death. MCTs can affect dogs of any age but typically affect middle-aged to older dogs. However, MCTs are a common tumor identified in young animals. Breed predilections support some component of underlying genetic cause. Mutations in the c-kit tyrosine kinase receptor are found in roughly 33% of these tumors. MCTs contain histamine and heparin. Dogs with MCTs have increased levels of circulating histamine, which may lead to GI ulcers and allergic reactions. Local release of heparin may slow blood clotting in the tumor area. MCTs have extremely variable biologic behavior; they range from relatively benign and curable with local excision to very aggressive, rapidly metastatic, and fatal (See Negative Prognostic Factors, page 56). Sites for metastasis include regional lymph nodes, spleen, liver, bone marrow, and skin; metastasis to the lungs is very rare. Duration of tumor presence and rate of growth are important—some dogs may have recent, rapid tumor growth while others may have a tumor that has been present and unchanged for months to sometimes years. Owners may report seeing the mass grow and shrink repeatedly; this is due to local histamine release that leads to intermittent swelling. GI signs (eg, vomiting, anorexia, tarry stools) may result from histamine release and gastric ulceration. Examination most often reveals single, firm nodules without a characteristic appearance; multiple lesions are possible. The nodules may be cutaneous or subcutaneous. Cutaneous tumors may or may not be haired, ulcerated, reddened, or painful. Subcutaneous tumors often feel like a lipoma. Both cutaneous and subcutaneous lesions may be freely movable or fixed and invasive. Regional lymph node size does not determine presence or absence of metastasis. Nodes may be large due to local inflammation and reactive hyperplasia, while nodes with metastasis may be normal in size. 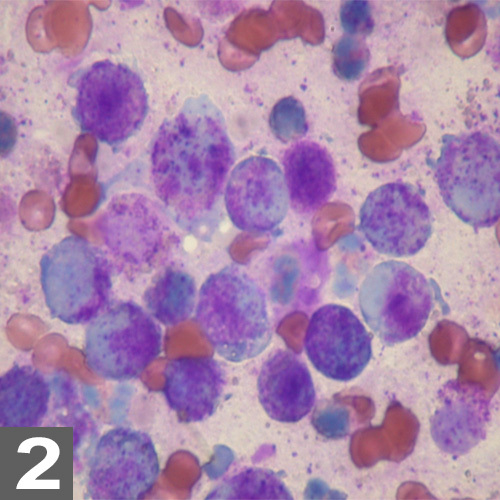 Definitive diagnosis is made with cytologic testing of fine-needle aspirate. Rare tumors do not stain well with Diff-Quik; these slides need to be stained with a Romanowsky-type stain (requiring submission to a clinical pathology laboratory) (Figures 1 and 2). Many theories exist as to why rare MCTs will not uptake Diff-Quik stain (including varying chemical compositions of the mast cells), but none has been proven. Biopsy with histopathologic testing is needed for tumor grading, assessment of mitotic index, and if needed special stains (c-kit, Ki-67 [a proliferation marker]). Figure 2. Cutaneous MCT stained with Diff-Quik stain; note the presence of round cells but absence of granules. Figure 3. Same tumor as in Figure 2, stained with a Romanowsky-type stain; the granules are easily visualized. MCTs rarely cause changes to the CBC, serum biochemical profile, and urinalysis. Buffy-coat preparation to assess for circulating mast cells has little utility in evaluating canine MCTs due to low specificity. Conducting staging tests before tumor removal is recommended when negative prognostic indicators are present. Staging tests may be conducted after tumor removal if histologic evaluation reveals a high-grade MCT or high mitotic index. When MCTs are present caudally, abdominal ultrasonography is used to assess the spleen (Figure 3. 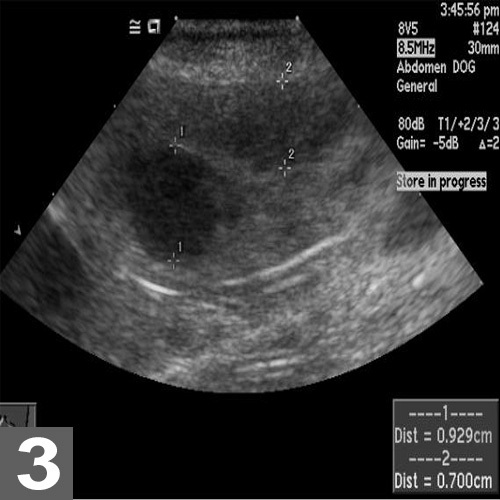 Ultrasound image of MCTs in the spleen of a dog with systemic mast cell disease. The patient’s primary tumor was located on the muzzle and controlled for 1 year until systemic progression occurred) and liver. Fine-needle aspiration of these organs may be useful, especially when a lesion is visible. Abdominal ultrasonography is also critical for assessing sublumbar lymph nodes when an MCT is present on the caudal aspect of a patient. 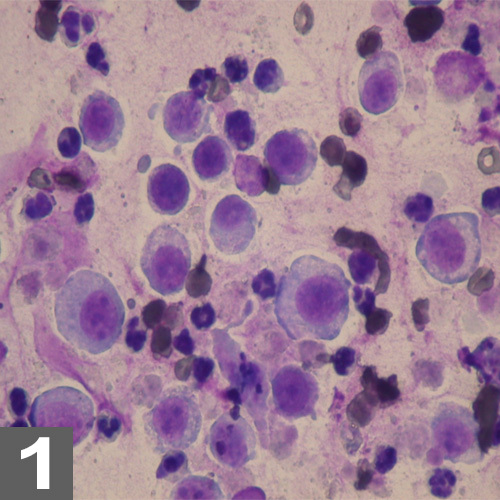 A cytologist needs to assess whether the appearance, number, and clustering of mast cells suggest metastasis. MCTs rarely metastasize to the lungs; however, thoracic radiographs may be helpful in evaluating sternal lymph nodes if the tumor is on the ventral abdomen or if visceral disease exists. Fine-needle aspiration of regional lymph nodes is critical even if the lymph nodes are not enlarged. All factors must be considered when attempting to predict how an individual MCT will act. Evidence of lymph node or internal metastasis signifies aggressive behavior, although some dogs with lymph node metastasis can live for years. In cases without metastasis, the histologic features listed are the gold standard of behavior prediction, but even they may be inaccurate at times. Surgical excision (2- to 3-cm margins) is the mainstay of therapy for low- to intermediate-grade tumors (grade 1 or 2) with a low mitotic index. Radiation can be used in cases with incomplete margins to help prevent local recurrence. Wide (2–3 cm around, 1 tissue plane deep to tumor) surgical excision should be performed. If wide margins are not achievable, narrow debulking surgery may be used, followed by radiation therapy. Radiation therapy has good efficacy in preventing local regrowth after incomplete resection. It also may be used against bulky disease as palliative therapy, with potential to shrink a bulky mass substantially. Chemotherapy may be beneficial for bulky, nonexcisable local disease or for treatment or prevention of systemic disease in dogs with negative prognostic factors. Vinblastine and lomustine have shown efficacy. Prednisone has some antitumor effects; it also helps decrease local swelling, which may be confused with an antitumor response. Prednisone is often combined with other chemotherapy agents. Targeted therapy includes tyrosine kinase inhibitors, which block c-kit signaling; toceranib phosphate, which is approved in the United States; and masitinib, which recently received conditional approval. Indications for these drugs are the same as for chemotherapy. Safety and efficacy of combining targeted drugs with chemotherapy are under investigation. As with chemotherapy agents, adverse effects also occur with targeted therapy. The most common adverse effects of toceranib phosphate are diarrhea, anorexia, and weight loss. Concurrent medications may be beneficial and include omeprazole, famotidine, and diphenoxylate–atropine. Antihistamines and GI mucosal protectants should be used as needed. All dogs with bulky MCTs should begin receiving histamine-1 (diphenhydramine) and histamine-2 (famotidine) blockers for life or until disease remission. Omeprazole may be used for refractory gastric ulcers. NSAIDs must be used with caution in dogs with MCTs because these patients are predisposed to gastric ulceration. Do not use NSAIDs if the dog is receiving prednisone or a targeted therapy drug. It is important to explain the unpredictable nature of MCTs (despite assessment of prognostic factors) to clients. Some patients without negative prognostic factors will develop systemic, aggressive disease, while others with negative factors will not relapse or have metastasis. Even local recurrence is unpredictable, with reported recurrence rate of 70% for incompletely resected tumors. If treating bulky disease, monitor response to therapy and adjust treatment as needed. If patient has finished therapy with no remaining evidence of disease, check for recurrence or new tumors at 1 month, every 3 months for 1.5 years, and every 6 months thereafter. Some dogs are prone to developing MCTs, regardless of whether it is a new tumor or systemic disease from a previous tumor. Any new mass should be aspirated and evaluated, then staged and treated as described previously. Varies considerably; most dogs will be cured with appropriate local therapy. Dogs with negative prognostic factors may still live for years with multimodal therapy. Ongoing evaluations of targeted therapies combined with chemotherapy may show improved response and survival rates in dogs with aggressive MCT. Proposal of a 2-tier histologic grading system for canine cutaneous mast cell tumors to more accurately predict biological behavior. Bailey KL, Kiupel M, Webster JD, et al. Vet Pathol 49:147-155, 2011.